An online associate degree in business management introduces students to a variety of business skills essential to successful leadership. While throughout the program you will take targeted courses such as economics and accounting, one of the most exciting things about this degree is the myriad ways it can be applied in an organization or field of your choice. There is no one management track with this degree. Today, virtually any organization that you're passionate about -- whether a major for-profit corporation, a medium-sized nonprofit, or your local healthcare clinic -- requires managers to coordinate ordinary, daily operations and to create long-term strategic plans to ensure solvency and to meet growth goals. Average annual salaries for professionals with this degree range from $35,000 to $50,000, and some senior-level positions pay much more. You may also encounter ample opportunities for career advancement, as your associate degree in business management online easily transfers into a bachelor's degree program. What Can I Do With an Online Associate in Management Degree and What Will I Learn? 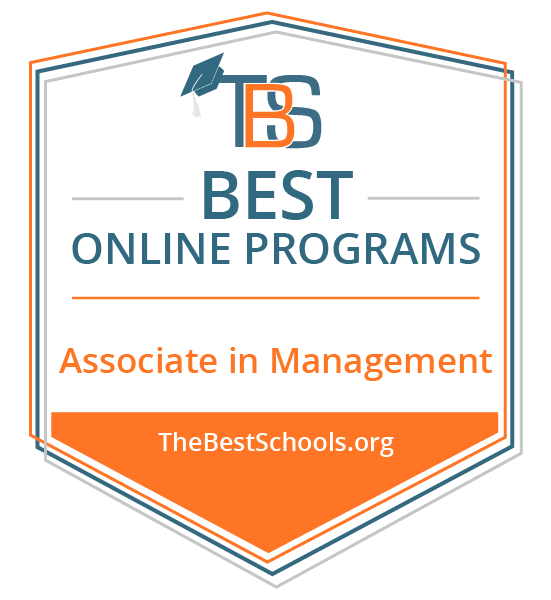 Clarion University of Pennsylvania ranks #1 on The 20 Best Online Associate in Management Programs! With two campuses and a substantial online presence, Clarion offers an online associate degree in business management that gives students the opportunity to graduate directly into a bachelor-level management program on campus after graduation. Students take the AS in business administration either online or on-campus at the Clarion or Venango campuses. Clarion's associate of science in business administration includes a concentration in general management. Students complete 60 credits of part-time study online. Transfer students or students with prior experience must complete the degree with at least 30 of the 60 credits, or 50% of major, for-credit curriculum at Clarion. Applicants to undergraduate business programs possess a minimum cumulative GPA of 2.5. Applicants who schedule a personal interview with an admissions counselor may waive their application fee. Students enrolled in the online associate degree in management typically complete multiple 15-week courses per term. The school offers some seven-week courses online. While students earning their degree online pay tuition and fees according to their in- or out-of-state residency, the cost of learning online at Clarion is significantly less than the university's traditional campus programs. Clarion University of Pennsylvania is regionally accredited by the Middle States Commission on Higher Education (MSCHE). Embry-Riddle Aeronautical University ranks #2 on The 20 Best Online Associate in Management Programs! The unique learning model cultivated by ERAU's Worldwide Campus is ideal for working professionals in and outside of the school's physical locations in Florida, Arizona, and Asia. Online degrees at ERAU emphasize a global worldview focused on both online and face-to-face instruction that accommodates students in the U.S. and around the world. The Department of Management and Technology offers an associate degree in business management online. All ERAU programs emphasize problem-solving, critical-thinking, leadership, and research skills that prepare students for gainful employment after graduation. The associate of science in technical management (ASTM) provides training in acute organization and planning of material assets and human resources in a variety of professional environments. Students may specialize in logistics, occupational safety and health, or engineering sciences, as well as numerous sub-specializations in applied information technology. The 60-credit program incorporates group activities and participatory courses in research and development for each specialization. Core courses in the ASTM include accounting, principles of management, and management information systems, as well as speciality courses like aeronautical science management. General education requirements incorporate curriculum from the social sciences, the humanities, and communication theory and skills that stress English composition and speech. Students may transfer up to nine credits in technical management or other business minors toward the degree; those without transferable credits may supplement their degree with approved management electives from core and general education curriculum within the ASTM program. Embry-Riddle Aeronautical University is regionally accredited by the Southern Association of Colleges and Schools (SACS). Fox Valley Technical College ranks #3 on The 20 Best Online Associate in Management Programs! With 15 campus locations throughout the state of Wisconsin, Fox Valley has made inclusive education a part of its mission for more than 100 years. Business, finance, and management majors constitute the majority of the school's nearly 250 academic programs, including an associate of applied science in management development. Students take the degree online in an accelerated format online, as well as at the college's Appleton, Oshkosh, Chilton, Waupaca, and Clintonville campuses. Fox Valley's online associate degree in business management focuses on enhancing a student's existing teamwork, leadership, and entrepreneurial skills. The program offers one of nine specialty tracks: general emphasis, accounting, agribusiness-dairy livestock, diesel, agribusiness-plant science, banking, entrepreneurship, global, or marketing. Students complete 60-62 credits, including an internship or culminating experience, depending on their area of emphasis. Core requirements are the same for all specialties and include a combination of technical and general studies courses in management theory, HR management, and business decision-making and problem-solving. The AAS incorporates content delivered entirely online, and Fox Valley offers a variety of flexible learning options for residents of Wisconsin. The school offers some programs in hybrid format, and many degrees incorporate the interactive video classroom (IVC) and/or require online coursework in addition to campus classes. At Fox Valley, distance learners pay a set, per-credit rate for online study, regardless of their state of residence. Fox Valley Technical College is regionally accredited by the Higher Learning Commission (HLC). Community Care College ranks #4 on The 20 Best Online Associate in Management Programs! In conjunction with Oklahoma Technical College and Clary Sage College, Community Care College offers the latest in vocational training for a variety of emerging professions in Oklahoma and throughout the U.S. The school caters to working students and specializes in business and healthcare and offers more than 10 evening and online program options. Community Care College's associate of occupational science (AOS) includes a focus in business and industry management. The occupational emphasis offers exclusively business-oriented courses that prepare graduates for employment. As a standalone program, the AOS degree enables students to pursue one of two paths of entry: an accelerated 10-month, “diploma-in-hand” program or a 20-month program that incorporates additional courses in professional development, entrepreneurship, and project management for students without previous college experience. Students complete courses online at the student's convenience or in the evenings on campus. Students can also customize the program in accordance with their professional goals. Through close communication between students and instructors through text, chat platforms, email, phone, and--if preferred--face-to-face meetings, students develop their ideas into professional business plans. Community Care College is nationally accredited by the Accrediting Commission of Career Schools and Colleges (ACCSC). Mesa Community College ranks #5 on The 20 Best Online Associate in Management Programs! In addition to its online campus, MCC occupies three physical locations across Mesa, Arizona, each with a focus on a different area of education and career training. The college's various sites emphasize programs in education, community involvement, and fire science and EMT training. MCC Online offers more than 500 distance courses and 20 degrees and certificate programs, including an online associate degree in business management. The associate of business in management at MCC offers concentrations in 10 distinct areas of study, including a general management track, management information systems, servant leadership, and emergency management. Students complete 62-63 credits toward the associate of business as a pathway to a transfer program at a public university. The school encourages applicants to meet with an academic advisor before enrolling to discuss academic and career goals. The curriculum in the online associate of business encompasses general education, business-specific, lower division, and elective courses. Online courses vary in length and may take between eight and 16 weeks to complete. Regardless of concentration, common lower division courses for all management students explore foundational concepts such as accounting; quantitative methods; and legal, ethical, and regulatory business issues. Mesa Community College is regionally accredited by the Higher Learning Commission (HLC). North Central Missouri College ranks #6 on The 20 Best Online Associate in Management Programs! With multiple locations in and around Trenton, NCMC is the second-oldest, publicly-supported community college in the state of Missouri. In addition to offering all of its general education courses online, NCMC also features nine programs that students complete entirely online, including the AAS in business and technology with an emphasis in management. A two-year program, NCMC's online associate degree in business management prepares graduates for a career in their choice of management-related occupations. Students complete 61- to-73 credit hours comprised of general education courses and curriculum tailored to their area of interest. Eligible applicants with transfer credits can enter the accelerated program, and students without developmental studies prerequisites take additional courses in core subjects. The school may require prospective business management students to take a placement test. The curriculum in the AAS degree covers topics like management and marketing principles, the humanities, business law, credit and finance, and entrepreneurship, and culminates in a business management internship during the second year. The school offers online students a set rate for tuition and fees. Students enrolled in online programs at NCMC participate in primarily lecture-based virtual classes, using email and chat platforms to communicate with instructors and peers. North Central Missouri College is regionally accredited by the Higher Learning Commission (HLC). Hagerstown Community College ranks #7 on The 20 Best Online Associate in Management Programs! In addition to its reputation as a premier provider of two-year degrees and certificates within the Hagerstown, Maryland community, HCC's Technical Innovation Center (TIC) is the largest business development organization if its kind in western Maryland. The school's LERN-certified Continuing Education and Workforce Development Division has received international recognition for its cutting edge programs, and HCC offers more than 240 courses and 24 degrees online. HCC's offers students an associate of applied science in management--a fully online two-year associate degree--in addition to several other degrees that combine online coursework with in-person campus requirements. The AAS comprises 60 credits over four semesters, or two years, and functions as a pathway to a bachelor's program in management or a related field at a four-year institution. Aside from fulfilling credit requirements in general education and management basics, students can select electives aligned with their prospective bachelor's degree with the help of a transfer advisor. Instructors deliver both online and hybrid courses through the Moodle LMS. Students who like to learn in-class take on-campus courses in the AAS in management program during the evenings. Whether an applicant plans to study online or on campus, HCC sets tuition and fee rates according to the student's residency status, including county and state specifics. Hagerstown Community College is regionally accredited by the Middle States Commission on Higher Education (MSCHE). Montgomery County Community College ranks #8 on The 20 Best Online Associate in Management Programs! MCCC offers students one of the nation's most comprehensive distance learning networks, including nearly a dozen degrees and certificates online, as well as several hybrid programs through its physical locations and virtual campuses. MCCC designs many of its degrees as career pathway programs that prepare graduates to not only advance their professional standing but also transfer into a bachelor's degree at a four-year university. One such program is the online associate degree in management. The AAS in management offers five concentrations: management, organizational leadership, marketing, office management, and real estate. Students complete 60-61 credits over two years that focus on 10 “core goals”--including composition and public speaking, analytic and quantitative skills, and the physical and life sciences. Additional requirements include concentration-specific coursework in business concepts and economics and macroeconomics courses. The marketing and office management concentrations include an internship in the final semester; management and marketing also offer the option of developing a sample entrepreneurial business plan. Most degrees strongly recommend internships that help students gain invaluable work experience. Students in both the on-campus and online tracks take the same classes and pay the same tuition rates. Instructors deliver coursework asynchronously through the Blackboard LMS. Through partnerships with the majority of Pennsylvania colleges and universities, MCCC ensures that courses completed through the virtual campus transfer seamlessly into local bachelor's degrees. Montgomery County Community College is regionally accredited by the Middle States Commission on Higher Education (MSCHE). State Fair Community College ranks #9 on The 20 Best Online Associate in Management Programs! With seven campus locations across the state of Missouri in addition to its online learning division, SFCC serves over 5,000 students in 14 counties with hundreds of courses and degree programs available online. SFCC's associate of applied science in business management with a management specialty caters to students hoping to enter the local job market. The associate degree in business management online strengthens a student's existing analytical, decision-making, and problem-solving skills. The emphasis in management incorporates coursework in communication, leadership, ethics, motivation, goal-setting, and organization. The 65-credit program covers general education courses with a focus on math, communications, American institutions, and wellness, as well as program requirements in topics like principles of macroeconomics, employment strategies, and business ethics. The degree includes a two-month summer internship that students complete after fulfilling at least 30 regular course credits. Courses transfer into a bachelor's degree in business through an SFCC extension campus at Central Methodist University. Applicants possess basic computer literacy and teamwork skills. Tuition and fees change relative to a students county and state of residency, whether they enroll in one major course of study or a dual-credit program, and their academic subject area. Alvin Community College ranks #10 on The 20 Best Online Associate in Management Programs! Located in Alvin, Texas, ACC brings together an impressive list of comprehensive programs through dozens of associate degrees, certificates, and professional programs available on-campus and online. ACC prepares its students for a wide variety of occupations in healthcare, technology, and communications and offers programs in management, sociology, and psychology entirely online, including an AAS in management, through its distance education department. The 60-credit associate degree in business management online at ACC prepares graduates for careers in general management by emphasizing cooperative education comprised primarily of core courses in communications, social and behavioral sciences, and creative arts. Cooperative education courses require the approval of a department chair prior to registration. Additional course requirements include topics in management/HR, general education, and recommended electives. Students pursuing the AAS as a pathway to a bachelor's degree at a four-year institution must also complete a course in computer applications. Students enrolled in the online associate degree in business management must complete a capstone course in special topics in marketing and marketing management to fulfill all degree requirements. While students complete the AAS degree entirely online, instructors may occasionally ask students to visit campus for orientations or tests; students unable to meet minimal campus requirements make special arrangements to complete coursework. ACC offers a variety of courses and programs in a hybrid format, combining internet-based study in Blackboard with face-to-face coursework. Alvin Community College is regionally accredited by the Southern Association of Colleges and Schools (SACS). Excelsior College ranks among The 20 Best Online Associate in Management Programs! Excelsior provides high-quality professional programs to non-traditional college students. The school caters to career-minded students with prior experience in the workforce or the military, and offers programs in seven fields of study: business, health sciences, liberal arts, nursing, public service, technology, and professional development. The AAS in administrative and management focuses on two things: transitioning students with non-traditional experience into an academic setting and preparing them for a career or a bachelor's degree. The curriculum provides students with the skills needed to draft correspondence, perform basic accounting and bookkeeping duties, manage staff, and utilize common business hardware and software. The 60-credit program encompasses equal parts arts and sciences, career, and elective courses, including an information literacy requirement. Core requirements in the business career component of the AAS degree culminate in a business strategy capstone course. Online courses at Excelsior include weekly assignments and are typically eight or 15 weeks in length. Students pay the same tuition rate regardless of program or location. Military personnel and veterans may receive discounted tuition rates. In concert with select local employers, Excelsior offers some studets tuition reimbursement plans. For applicants interested in transferring into the AAS in management, Excelsior requires a minimum grade of C- on all transfer credits. Excelsior College is regionally accredited by the Middle States Commission on Higher Education (MSCHE). Tidewater Community College ranks among The 20 Best Online Associate in Management Programs! Occupying 10 campuses and educational facilities in and around Hampton Roads, TCC is the second-largest school in the Virginia Community College System. The college is also the region's largest provider of workforce services, with a student population of more than 37,000 enrolled in one of TCC's signature career-pathway degrees. Academic programs at TCC focus on health professions, computer science and IT, and public and professional services, and cater to non-traditional students through accelerated and short-term degrees, transfer programs, and continuing education online. Students complete the associate of applied science in management at TCC entirely online. The curriculum incorporates both a theoretical and hands-on approach to management, emphasizing accounting, marketing, HR, business law, and economics coursework. The program encompasses a minimum of at least 67 credits over four semesters, including an . optional cooperative education track that enables students to translate work experience into academic credit. Students choose from a variety of electives exploring topics such as health and physical education, humanities, and social science during the second, third, and fourth semesters. The school determines tuition and fees on a per-credit basis, according to whether a students holds residence in- or out-of-state. The school also offers special rates for military contract and business contract students. Instructors deliver coursework through the Blackboard LMS. Tidewater Community College is regionally accredited by the Southern Association of Colleges and Schools (SACS). Mercer County Community College ranks among The 20 Best Online Associate in Management Programs! With two campuses in West Windsor and Trenton, New Jersey, MCCC enrolls more than 11,000 students, most of them studying part-time. The school features an on-site employment placement service and guarantees transfer into several four-year universities in NJ through its dual-admissions programs. The associate degree in business management online at MCCC provides students with a broad range of career opportunities in business after graduation. Students choose to focus on general business or select a concentration in either management or entrepreneurship. For interested students, the program leads directly into MCCC's bachelor's degrees in labor or management studies. The curriculum in the business management AAS encompasses two years and 62-64 credits in core courses, including English composition and public speaking, office accounting, and business communications, as well as concentration electives in the third and fourth semesters. The program culminates in a capstone course in international business practice. Though students can complete the AAS in business management entirely online, MCCC also offers many of its degrees through either full-time and part-time hybrid study. Students pace themselves, and some courses require proctored exams on campus--though out-of-state students make special arrangements. The school determines tuition rates by whether students reside inside or outside of Mercer county or the state. Mercer County Community College is regionally accredited by the Middle States Commission on Higher Education (MSCHE). North Hennepin Community College ranks among The 20 Best Online Associate in Management Programs! Serving a five-city area in and around Brooklyn Park, Minnesota, NHCC emphasizes associate degrees and professional programs in high-demand fields. NHCC offers more than 60 academic programs in majors like business management, nursing, liberal arts, computer science, and law enforcement. Coursework provides entry-level education leading to a career or transferability into a BA degree at NHCC--or through one of Minnesota's partnering four-year universities. The AAS in management features a broad focus in business and general education, with an emphasis on specialized management skills. The curriculum encompasses 60 credits, including core courses in financial accounting, marketing, business computer systems, college writing and public speaking, and micro- and macro-economics. Marketing-specific coursework explores entrepreneurship, legal aspects of business, and management applications in a professional setting. Students may choose electives in a variety of liberal arts and social/physical science topics. Courses in the online associate degree in business management transfer into a bachelor's degree in a wide variety of areas, including organizational management, HR, and marketing and innovation. NHCC adapted its programs to meet the expanding needs of non-traditional students through numerous live-streaming technologies featuring “classroom capture” and telepresence courses. Instructors deliver coursework synchronously or asynchronously depending on the program. North Hennepin Community College is regionally accredited by the Higher Learning Commission (HLC). Northland Community and Technical College ranks among The 20 Best Online Associate in Management Programs! NCTC boasts four campuses across Minnesota, as well as an online education division. NCTC offers dozens of academic programs with career-focused students in mind, including an entire campus dedicated to aerospace as well as a customizable bridge program in the liberal arts. Online students can choose from a variety of in-demand majors and fields, including liberal arts and sciences, manufacturing, health and human services, and business and entrepreneurship. NCTC's AAS in sales, marketing, and management explores critical professional development in each of these areas. The 60-credit program emphasizes core skills needed in any business occupation, including decision-making, communication, problem-solving, and computer technology. The online associate degree in business management stresses career skills specific to sales, marketing, and management that includes research, customer service, and small business planning foci. Though not required to complete the degree, students may choose a single or a two-part internship as part of their optional elective credits. Applicants to the associate degree in sales, marketing, and management at NCTC must meet all prerequisites and maintain a grade of at least “C” in all required coursework for the duration of the program. They must achieve a score of at least 78 in reading comprehension and 50 in math on the Accuplacer Assessment Test. NCTC offers a set tuition rate for distance education courses regardless of a student's place of residence. Northland Community and Technical College is regionally accredited by the Higher Learning Commission (HLC). With two campus locations and right additional educational centers across northeast Iowa, NICC serves students in eight counties through several academic and professional programs. The college offers more than 69 degrees and certificates in nine areas of study, as well as vocational training programs in industry/trade occupations and adult literacy and education. Students choose from several flexible formats that enable them to take courses on campus, during evenings only, online, or in hybrid format. NICC's department of business, management, and hospitality offers students an online AAS in applied management. The two-year program encompasses a minimum of 47 credits in foundational business and management skills that focus on economics, marketing, accounting, and supervision. Coursework required during the first semester includes an introductory overview of the college experience. Students may add up to 28 additional credits from technical and career electives. The associate degree in business management online covers three terms of study in the fall, spring, and summer semesters; students may enter the program at any time. Students complete coursework asynchronously in the applied management AAS entirely online. NICC's AAS programs prepare graduates to enter the workforce immediately following graduation in an entry-level position or to pursue a bachelor's degree at a four-year university. Northeast Iowa Community College is regionally accredited by the Higher Learning Commission (HLC). Portland Community College ranks among The 20 Best Online Associate in Management Programs! As Oregon's largest post-secondary institution, PCC offers programs with a dual purpose: to prepare its students for a variety of professional roles and to support the local workforce. The college offers dozens of associate degrees, certificates, and career pathways in seven areas, including business and data, public service, and health and wellness. The majority of PCC's associate of science degrees provide graduates with the prerequisites they need to enter directly into a bachelor's degree at a four-year institution. The AAS, however, prepares students for gainful employment immediately following graduation. The online associate of applied science in management emphasizes a comprehensive skill set in core business skills, with broad applications in any industry or field. The two-year program requires college-level writing and math proficiency; students may be required to take placement tests to determine their academic preparedness. Coursework explores fundamental management topics such as accounting, business technology, business law, and entrepreneurship. The online associate degree in business management includes a cooperative education component comprised of a two-part field experience and feedback course focused on bookkeeping, international business, management, advertising, and marketing, among other topics. Instructors expect students to log into the virtual learning environment regularly throughout each week to complete assignments and interact with course material and peers. The school basis tuition rates on whether a student lives inside of or outside of Oregon. Portland Community College is regionally accredited by the Northwest Commission on Colleges and Universities (NWCCU). Maysville Community and Technical College ranks among The 20 Best Online Associate in Management Programs! With five campus locations across Northeastern Kentucky and an online school, MCTC offers dozens of associate degrees and certificates in over 25 areas of study, including lucrative fields such as nursing, information technology, and business administration. Upon graduation from an AS program at MCTC, students may either transfer to any four-year university in Kentucky or enter a career of their choice. MCTC's offers an associate of applied science in business studies with management option. Coursework in the 64-credit AAS program emphasizes crucial business skills in economics, management, marketing, accounting, business law, and communications. The two-year degree with a management focus includes a four-part curriculum in core general education, core technical, required management option, and technical elective courses. Students must complete a business employability seminar and an applied management skills course, both recommended for completion in the final semester. Students can transfer courses in the online associate degree in business management to a bachelor's program at a four-year university. At MCTC, online students pay the same per-credit tuition rate as in-state students. Instructors deliver coursework through the Blackboard LMS entirely online--though in some cases exams must be proctored and set to certain specifications by select instructors. Maysville Community and Technical College is regionally accredited by the Southern Association of Colleges and Schools (SACS). American River College ranks among The 20 Best Online Associate in Management Programs! One of the largest community colleges in California, ARC serves more than 30,000 students with both on-campus and online programs. The school features dozens of degrees and certificates across 11 academic areas, as well as a variety of general education courses that students complete online. The associate of arts in management provides in-depth study of core concepts, including communication, organizational behavior, HR, business computer applications, and diversity management. The curriculum encompasses 60 credits in general education, program requirements, and electives, with a focus in technology, hardware, and software specific to business management occupations. For students with transferable credits, the program requires at least 12 credits to be completed at ARC. Students must maintain a minimum “C” grade in all required reading, writing, and math courses in order to complete the degree. Instructors deliver online coursework through the Canvas LMS, which includes 24/7 phone support for technical issues. ARC offers several options to students who prefer a combination of online and on-campus study, including hybrid and web-enhanced courses. Classes completed online follow the same general semester schedule as on-campus courses. American River College is regionally accredited by the WASC Senior College and University Commission. Chemeketa Community College ranks among The 20 Best Online Associate in Management Programs! Chemeketa caters to working professionals with a variety of transfer degrees, bridge and vocational programs, and skill-building certificates. The college offers 10 degrees, 19 certificates, and nearly 1200 courses online, including the AAS in management and various other business management programs focused on retail, procurement, and sustainability management. Chemeketa's online associate degree in business management prepares students for diverse entry-level career opportunities in business and management. Coursework encompasses core business skills like strategic planning, marketing, leadership, teamwork, research, and financial reporting and interpreting. The two-year degree offers several work experience courses, worth between one and 12 credits, which include field placement in a business, industry, or agency aligned with a student's particular professional goals. Credits completed in the online AAS lead to gainful employment immediately after graduation or count toward a bachelor's degree at Portland State University, the University of Oregon, or other transfer-friendly four-year institution. Distance courses generally follow the same schedule as on-campus courses, with required classes available throughout the fall, winter, spring, and summer terms. Non-international students (with permanent residency in the domestic U.S.) studying online at Chemeketa pay the same tuition rate as Oregon residents. Chemeketa Community College is regionally accredited by the Northwest Commission on Colleges and Universities (NWCCU). According to the NACE 2015 Fall Salary Survey, students who earned their business-related bachelor's degree earned higher than average starting salaries. Therefore, while your associate degree opens many professional opportunities, earning your bachelor's degree in management or business administration is the best way to ensure that you qualify for the largest number of well-paying positions. A bachelor's degree in business administration helps you hone a variety of skills for management positions in a wide range of industries. While pursuing this degree, you will learn how to run day-to-day operations and plan strategically for the future. This degree program explores organizational behavior, leadership strategies, accounting, and more. It is designed to equip graduates with the skills necessary to serve in senior roles in a variety of organizations. This degree builds on the skills you've learned through your associate in management program by training you to become a business leader who directs, coordinates, and supervises healthcare services.